"The rancho provided another means whereby Indian labor was integrated into the Hispano economy. Beginning in the 1780's soldiers and settlers were allowed to graze stock in the countryside, using Indian labor entirely. Title to the land always was retained by the Crown, and the ranch owner almost always lived in town, leaving his stock and crops in the hands of Indians working on a share-crop basis. Gradually the Indians became serfs similar to the economy of the Deep South." From: Native Americans of California and Nevada, by Forbes, 1969. 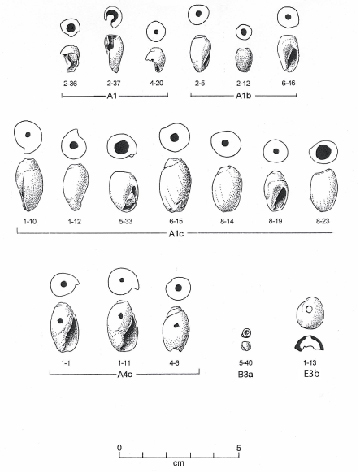 Olivella beads abundant during the Protohistoric and Historic Periods in central California.